Talk of uniting the nation is pleasing, but recent security incidents provide a mirror to deep divisions in our society. The first incident we should examine is the terrorist attack in Charsadda. As jihadi militants stormed Bacha Khan University, many students were left helpless except for the courageous response of Lecturer Syed Hamid Husain who died defending his students with his 9mm pistol. One might ask why a Chemistry teacher was armed with a 9mm pistol, but wasn’t this the security plan for schools since APS massacre? While teachers are carrying weapons to defend their students, KP government is launching a new special police force to protect VIPs. So some in society are not only deserving of protection by commandos, but even another special security force also. However, if teachers and students are abandoned, at least they are not targeted. The same cannot be said of poor workers who are attacked by their own armed forces. 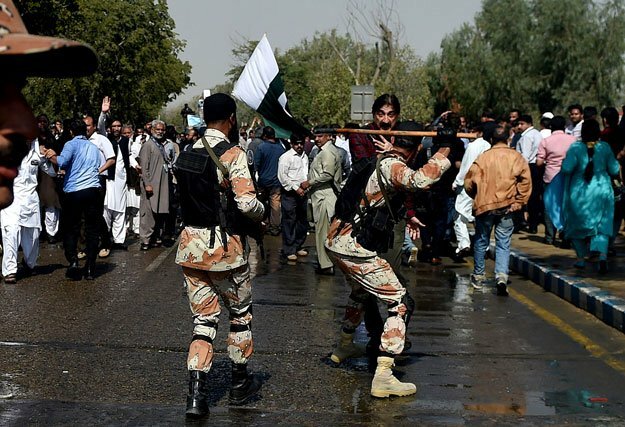 Two protesting workers of Pakistan International Airline (PIA) lost their lives and at least 18 others were injured during a clash with Rangers and police at Jinnah International Airport in Karachi, Samaa reported. Water canon was used to disperse the employees who are protesting against proposed privatization of PIA. Reports said Rangers resorted to baton charge and fired teargas shells after stone-pelting by infuriated workers, leaving dozens of them injured. Are these not divisions that we see every day in black and white? No expense is spared in protecting elites of society, children are abandoned to their own fate, and anyone who dares to question the elites feels the full force of the state come down on their heads. It is understood now that military action alone cannot make the country secure, and more people are beginning to understand that we must also defeat the extremist mindset. For Pakistan to reach its natural greatness, though, we must also remove these divisions in our society.